Thank you for reviewing this book. I’ve already ordered it. Knowing how to find your authentic No or your Yes is crucial for any decision. And clearly there is a cost when you can’t do that. When I help women discover their truth of whether to become a mother part of their journey is discovering when they were systematically steered away from knowing their truth or their yes or their no. 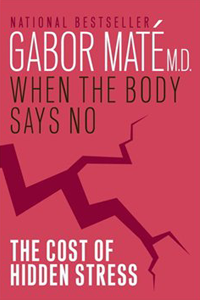 I hope you enjoy “When the Body Says No” book. Well, okay…it’s not an ‘enjoyable’ read per se – but is a very educational one! Glad to see that this important book hit your radar. It really made me do a double-take and reconsider my wellness strategy. I’ve seen Dr. Mate’ and his son co-present on the topic of parent/adult child relationship. Great stuff! I hope that a book comes out of it. Oh, I bet that co-presentation would have been excellent…and yes, let’s hope there is a book to come out of it! I, too, am very glad the book, “When the Body Says No” hit my radar. I also found “Realm of the Hungry Ghost” fascinating (about addictions). Thanks for reading this blog and posting a feedback.